From the dawn of times humans dreamed of flying like the birds and the more ambitious even controlling the “third dimension”. Like other peoples Greeks were no exception in having the same aspiration as described in the ancient Greek legends about Phaeton (Ov. Met. viii. 195; Hygin. Fab. 40.) and Icarus. (Eurip. Hippol. 737, &c.; Apollon. Rhod. iv. 598) Both legends underline the fact that Greeks understood, that as in other activities, that caution always should be exercised because overestimating one’s self in the attempt to conquer the air can be fatal as shown by the tragic ends of the two ancient heroes. Even today the students of the Hellenic Air Force Aviation Academy are known as “Icaroi”. (plural) The aim of this essay is to present a short history of the first fifty years of the Hellenic Air Power Development from its infancy to the early stages of introduction of the jet engines and missiles (rockets) used for the purpose of war. While the Ancient Greek engineer Hero for Alexandria is credited with the creation of one the earliest flying machines  and centuries later upper class Greeks who traveled in Europe were aware of the hot air balloons the true history of historical flying in Greece started a few years after the Wright brothers invented the first airplane. Initially the balloon and the airplane was considered a toy for the rich or a public relation instrument to show in a veiled way the power of the Balkan rulers and governors who could travel by air projected a powerful image, thus keeping their people in awe. Yet Greece was fortunate enough to have in the face of the lawyer Alfred Athanasopoulos one of the first theorists of the airplane’s promising future in peace and war. Athansopoulos published his opinions in the Greek press in 1907 and touched the feelings of the Greeks. At the beginning of the 20th century, in a country that been humiliated in the Greco-Turkish War of 1897, there was a widespread public feeling that the new century with its new “miracles of technology” would allow the new state, with less than 100 years of modern existence (which contrasted with the Greek nation’s long history) the means to wash away the disgrace of the last century’s defeat. In 1908 this feeling became stronger as Leonidas Arniotis, a private individual and showman performed the first successful flight in Greece. Greek Prime Minister. E. Venizelos who after flying on a private airplane piloted by Em. Argyropulos in February 1912 baptized it “Halcyon”, (= kingfisher) the Ancient Greek symbol of hope, seemed to encourage the popular feeling. In his speech for the occasion he said that: “The airplane is suitable as a weapon of the weak. The audacious and daring nature of the Greek will transform it to a splendid weapon of War, capable of rendering great services”. But progress was not without cost as another private individual A. Karamanlakis was the fist victim of an aircraft accident in Greece. Perhaps in an effort to keep up the peoples faith in the airplane or (the fight myth as cynics might say) the press in Athens wrote that: “Just as Ancient Hellas offered Icarus as sacrifice to the quest of conquering the skies, today modern Hellas offers Karamanlakis”. In order to understand the early development of the Hellenic Air Power, two things should be taken into account: First “The Military was in that region in the past the sole user, consumer and beneficiary of certain technologies. It was also the main force behind their adoption, as local industry didn’t have the required capital nor the resources or simply was not interested in them.” Technology in the late 19th – early 20th century Balkans was largely disseminated to the general public and the private sector through the armed forces and many enlisted men learn trades during their national service and used the skills thus acquired in their private lives afterwards. Second, Greece was very much influenced by France not only culturally but also in matters of science and technology and many times French experts were employed when new skills had to be imported. Under this light the French influence and involvement in the early development of the aviation in Greece is no surprise. In 1911 six army officers were sent to France for training and the first aircraft were ordered to the French firm “Farman”. Lieut. D. Kamberos executed the first military flight during military maneuvers. The same officer flew the first seaplane in Greece in June 1912 during feasibility tests for the establishment of a naval air service. In September 1912 the 1st Aviators Company was setup in Larissa. The government, always short of funds, relied heavily on the public admiration of “the new peculiarity of the airplane” and exploited for its fundraising campaigns that made possible the building of the first military airfield. Greek air power had finally taken material form. In October 1912 Greece, Bulgaria, Serbia and Montenegro declared war on the Ottoman Empire and their armies started advancing in the enemy territory. On 5th October 1912 the Hellenic Army started advancing northwards and Kamberos executed the first aerial reconnaissance in Greek history that greatly aided the Army during the battle of Elason. The aircrafts did not have any other instruments except a barometer and no comforts whatsoever for the passengers. According to an order issued by the Hellenic High Command the airplanes had under their wings blue and white stripes (the national colors) in order to be distinguished from the Turkish airplanes. Hellenic airmen never met while flying with their Ottoman counterparts, so no aerial combat took place. They mainly executed air observation and air reconnaissance missions and in some occasions the attacked the enemy with a type of experimental bomb that had been designed by Kamberos. First Lieut. Moutousis bombed the Ottoman fortifications at Bizani by he did not do significant damage. But the attack was executed in full sight of the assaulting Greek infantry to raise their morale and if possibly to lower the psychology of the defenders. While the Hellenic army was assaulting Bizani a Greek airplanes threw newspapers and provisions to the besieged people of Ioannina in what is probably the first recorded use of air power for both relief and psychological operations. On 24th January 1913, First Lieut. Moutousis, having as passenger Ensign A. Moraitines flew over the Dardanelles on a Farman hydroplane in an air reconnaissance mission to discover the dispositions of the Ottoman fleet. They also dropped bombs that caused minimal damage but the airplane had to land on the sea because of mechanical problems. Though they had to be towed to base by destroyer “Velos”, they gave important information to the fleet commander so the mission was a success. The frequent missions of the Greek pilots over the Asia Minor coastline made the Turkish press complain about the impunity with which they flew over the Ottoman forces. Yet no exploitation was done by the Hellenic Army or Navy of this fact. But we need to take in to account the fact that none of the belligerents had a tactical doctrine for the use of the new weapon. During the second Balkan war Bulgaria, who initially possessed the largest aerial fleet, attacked Greeks and Serbs but was defeated. No recorded aerial conflicts between belligerents exist and the usual observation and bombing missions were the norm. Hellenic aviation though, had its first dead a few days after the end of the war when 2nd Lieut. E. Argyropoulos who had joined the Army equipped with his own private Bleriot XI aircraft was killed in an accident. Immediately after the war the Hellenic Navy started organizing its aerial service with British aid. In 1914 the first five naval pilots were ready for service. They had also trained to takeoff from the sea and land back there as there was no airfield initially in Elefsis, (!) probably something unique in the world at that time. While in 1914 Greece initially enjoyed the advantage of having a naval air service the Ottoman Navy quickly followed suit. Greece declared neutrality in the first stages of the war and there was alack of funds that prohibited further development. Despite that Kamberos established a pilots training school in Thessalonica. The decision to go or not to go in war at the side of Entente or the Central Empires deeply divided the nation to the effect that there were to governments: one in Athens under the royalists and one in Thessaloniki under Venizelos. Pressure from the Allies brought the resignation of the king to abdicate in 1917 and leave the fate of the country to hi son and the Thessalonica government. Hellenic Army aviation was reorganized by the French with french airplanes and Naval aviation by the British with british material. The circular markings that the Hellenic Air Force used today were adopted at that time along with the use of the parachute. The Army operated the No 531 Fighting Squadron as well as the Nos 532 and 533 Reconnaissance-Bombing Squadrons and their war activities comprised patrols and reconnaissance, as well as attacks against enemy trenches constantly pressuring the Bulgarians. They earned the congratulations of the French HQ for their excellence. The Hellenic Navy operated the “Z” Squadron. Its missions included anti-submarine search and attacks against targets of vital importance to the enemy navies as well as engaging itself in air battles. Its commander A. Moraitines that the British called the “fearless aviator” and the foreign journalists “The Ace of the Mediterranean” was involved in the “Goeben affair”. Seventeen pilots were the price that Greece had to pay for its assistance to the Entente victory. A Greek Squadron served also in the Anglo-French expedition against the Bolsheviks in 1919. As a reward for their support of the Entente the Greeks were allowed to occupy Eastern Thrace and the Smyrna enclave in Asia Minor. Turkish leader Mustafa Kemal rejected the capitulation terms and started armed resistance against the Hellenic Army. The Greek air force found its self with aging equipment and inability to operate due to lack of fuel. The issue was partly solved as forgotten German fuel from WWI leftovers were found and so three squadrons of the Army and one from the Navy went into action. The Greek pilots executed a wide range of missions such as reconnaissance, strafing and bombing the Turkish forces as effectively covering a front that reached 700 km in 1921. Initially, as Kemal struggled to re-organize the Turkish air force, the Greeks enjoyed air superiority but as time passed the air fights increased as the Turks attempted to wrest the skies from the Hellenic Air Force. A bad choice of political moves left Greece unsupported by the Anglo-French and the Hellenic Army evacuated Asia Minor. The situation was far from ideal as Greece was smarting from the defeat and had to settle 1,500,000 refugees. But from1925 the air forces was upgrading with new material and in an attempt to decrease dependency on foreign suppliers set up air aircraft factory with the air of a British company. The factory did maintenance work, built spare parts and finally was able to construct airplanes like the Avro 504 under license. In 1928 a Breguet 19, named «HELLAS», with pilot Evangelos Papadakis and observer Christos Adamides took off from Athens and covered a distance of 12.000 Km. while circling the Mediterranean in a 20 day flying tour. An example of air power used for uplifting the nation’s spirit and government propaganda, as a cynic would observe. In 1930 the naval and military air branches were unified and the Hellenic Air Force was officially made the third branch of the Hellenic Armed Forces under the supervision of the Air Ministry. After that the Meteorological Service and the Air Force Academy were instituted with British help and advisors. The new Service showed itself to the world with an airplane that toured the Balkan capitals in 1934. 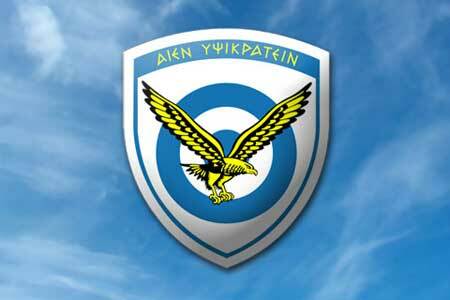 Next year the Hellenic Air Force was involved in the “coup of 35” and staying loyal to the government carried out missions against the militants of the opposition. During these unfortunate times, it was demonstrated that air power gave the advantage to the one who controlled the skies. After that Greece became an authoritarian state. The Airplanes factory was nationalized and another attempt was made to upgrade the Air Force as the international events predicted a new war. Greece declared its neutrality and bought material from Britain, France, Germany and even Poland in attempt not to be dependent on a single supplier. Fundraising campaigns for the support of the Air Force were organized, seven new airfields were built and early warning system based on air patrols and observers was established by May 1940 but the poor state of the economy the hindered upgrading the planes and the infrastructure. With Poland, Belgium and France overrun by the Germans, support for aircraft and weapons bought from these countries disappeared. Britain fighting for survival could not spare much stuff for sale either. Hellenic Air Force would enter WW2 with serious disadvantages. On 28th of October 1940 Italy attacked Greece, despite the Greek policy of appeasement and non-provocation. The Italians had more than 300 available aircraft that could attack from Italy, Albania and the occupied Dodecanese and supported by that country’s industrial base. The Royal Hellenic Air Force had less than 80 serviceable aircraft that most of them could not compare with Italian opponents, had limited technical support. Most Greek airplanes lacked communication with the ground, sighting devices and were outdated. It can be reasonably argued that the pilots were asked to execute near suicidal missions. Two days after the invasion Lieut. E. Giannaris was the first Greek officer to die in the line of duty when his plane was shot down over Pindus. But on 2nd November 1940 a Greek recon plane discovered the route of the main Italian thrust enabling the Hellenic Army to block it. Suicidal defiance of enemy airpower had paid off. Thirteen Greek cities suffered bombing attacks. The Greek pilots had only their courage and love for their country to counter the enemy. Flying Officer Marinos Metralexis after spending his ammunition during an aerial fight he rammed an enemy aircraft and then escaped with parachute. When he landed he also arrested the bailed out Italians with his… pistol! The Royal Hellenic Air forces fought with such determination that the Italian C-C, Praska had to ask Mussolini for reinforcements. Aerial warfare over Greece proved that what looks good on paper, may not work in practice as the Italians never managed to gain air superiority. The Greeks managed to mobilize and drive the invader off their soil but the disparity had affected them. By the end of March 1941 they had only 45 serviceable aircraft. The thinly stretched RAF could spare very little airplanes to assist their ally. On April 6 1942 Hitler came to the rescue of his unsuccessful ally. Both Greeks and British did their best but courage and self-sacrifice were poor substitute against the hardened veterans of the Luftwaffe who enjoyed superiority both in quality and quantity.Fifty-two Greek airmen had been killed so far. The British Expeditionary Force along with Greek strugglers had to evacuate to Egypt and the Greek Air Force cadets after an adventurous trip from Crete found themselves there too. What remained of the Greek airplanes flew there also. In May 1941 the Greeks were at the receiving end of another and novel to them type of air power as the German parachutists captured Crete. The Greek government in exile put the Royal Hellenic Air Force personnel under the command of the RAF and Britain took over to supply equipment and infrastructure so that the Greeks could continue the war against the Axis. Greek pilots studying in Habanyia (Iraq) assisted the British to subdue the coup d’etat of Rashid Ali. After that the Greeks were sent to RAF schools in Rhodesia to continue with their training in more advanced equipment and tactics. The Greek units served in a variety of roles assisting the allied war effort in the Mediterranean operational theater. In November 1944 they flew from Italy to Greece that the Germans had evacuated. Seventy more Greek airmen had paid the ultimate price for the liberation of their homeland. During their exile in the Middle East the Greek armed forces developed for the first time special commando forces that were also parachute qualified and worked together with British commandos for operations in the Axis occupied Aegean Islands. This was how additional uses of air power except airplane operations were introduced for the first time in the Hellenic Army. Extreme political strife is unfortunately an affliction that tortures Greece from the ancient times, and true to this negative tradition the newly liberated country was facing armed conflicts between Nationalist and Communists from December 1944 that led to an all out civil war in 1946. The communist armed groups constantly harassing nationalist forces had grown to a sizable army but they had no airpower. During the difficult first two years the embattled government in Athens used the Air Force for reconnaissance and air supply missions to isolated areas. With artillery in short supply or unable to cross the mountainous terrain the air force was used as “flying artillery” but the pilots had difficulty locating an enemy hidden in caves and forests and moving only by night. The equipment of the RHAF also was not suited for counter-insurgency operations and cooperation with the Army was faulty in the initial stages of the war. In 1948 with the Truman doctrine into effect the RHAF was upgraded. The communists also made the mistake to abandon guerilla tactics and try to hold ground like regular army. To counter their lack of air power the started targeting the Air Force personnel with terrorist activity on the ground attacking the airmen with bombings and shootings but most were thwarted both by police and the military. The introduction of the “Helldiver” dive-bomber and the napalm bombs allowed the RHAF to pulverize the communist resistance and make possible the Army’s victory in 1949. During this period the Greek bombers had the dubious privilege of being the first to drop napalm bombs in combat. The end of the civil war did not brought immediate rest to the Greek Air force. A transport squadron was sent to assist the UN Forces in Korea. It was probably a way to pay back the Marshall Plan the cynics could argue, as the impoverished state could not afford the luxury of overseas operations. The infrastructure for the introduction of jet planes in Greece started in 1951 as the country with US aid was modernizing its armed forces with view to join NATO (joined 1952). In order to show its entrance into modern air power period, the Hellenic Air Force created an acrobatic air team for the first time in its history. In 1960 anti aircraft missiles were introduced for the defense of Greek airspace. It is little known that Greek jet planes flew secret missions over the neighboring Warsaw Pact countries (Albania, Bulgaria) for the benefit of NATO from 1955 to 1960 and went to war readiness during the Cuba-Missiles Crisis in 1962. The flights were stopped as spy satellites could do it with less exposure to the communist air defences. In fifty years Greek Air Power started from a dilettante’s toy and evolved into a means that would serve the dream of Greek territorial expansion, (Megali Idea) independence and projection of national pride. The dream was shuttered with the end of the Asia Minor campaign in 1922. Greek air power limited by the meager finances of the State became dependent on the expensive imports and support from abroad along with “attached political strings”. While Greek pilots fought bravely, they could do it only with the support of the British in WW2 and then the Americans afterwards. The introduction of new technologies after 1970 was done with US aid and the country is still dependent on careful diplomatic steps in order to maintain probably the most expensive and crucial aspects of modern warfare. “Flight” magazine 11th Nov. 1911 retrieved from the “Flightglobal” web site digital archive. “Flight” magazine 14th Sep. 1912 retrieved from the “Flightglobal” web site digital archive. D. Stergiou, Tearing the Iron Curtin, Army & Tactic magazine February 2011 in Greek.